As some of you know on september the 8th , on the way to set (on 15/love) Jaclyn and Vadim were killed in a car crash. They were both 17 years old and were killed. WHen I first heard about this I was so sickened. They were so beautiful I was shocked when I found out. I feel soi bad for there family and friends. They were so good on the show too. This part of the site was dedicated for them, to remember them. Best known for her roles as the voice of the English Caillou, Jaclyn Linetsky (1986-2003) was a Canadian actress. 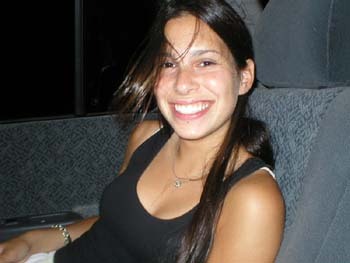 Jaclyn Linetsky was born in 1986 to Larry and Terry Linetsky and raised in Montréal. Upon her death, she lived in a suburb called Hampstead. Between 2000 and 2002 Linetsky dubbed the English voice for the title character in the preschool animated series Caillou. She also provided the voices for Bitzi in the 2002 animated series Daft Planet, and Meg in Mega Babies. She was among the class of 2003 from St. George's High School; she was the valedictorian. In 2003, Jaclyn was cast in a tennis-circuit themed dramatic show called 15/Love, for air on YTV. Her character was mutually falling in love with co-star Vadim Schneider's character. In an automobile accident near Montréal, Quebec, Canada both Linetsky and Schneider were killed while driving to the filming of an episode of 15/Love. Their vehicle, a rental minivan, lost control and collided with oncoming traffic. Montreal: Overcoming the kind of tragedy that would paralyze some production companies, Galafilm is prepping 14 new episodes of 15/Love, its edgy teen drama about tennis prodigies living at a cutthroat sports academy. The new season comes just five months after two of the lead actors, Jaclyn Linetsky and Vadim Schneider, were killed in a car accident. "After the accident, we shut down production. When we recovered from the initial shock and consulted the parents, we learned that the families really wanted us to finish the series - as a tribute," recalls co-creator Derek Schreyer. Linetsky and Schneider died just before season one wrapped. "So we created new characters, instead of casting replacement actors, and rewrote the last episodes to incorporate the tragedy. It's what the parents wanted." A car wreck was written into the end of season one, killing Linetsky and Schneider's characters, and two new pupils were written in, played by Amanda Crew and Nwamiko Madden. Season one, 26 eps at $11 million, will debut this fall on YTV and Radio-Canada. Schreyer (Cold Squad, I Was a Sixth Grade Alien) writes and exec produces with co-creator Karen Troubetzkoy (The Magician's House, The Adventures of Shirley Holmes). Work began on season one of the English-language series last June, shooting for 98 days in the Quebec countryside. Playback visited the set in December, an abandoned 150-year-old convent on Lake Memphremagog, in the Eastern Townships of Quebec. Thanks to production designer Andre Chamberland, the place easily passes for the Cascadia sports academy, having worked around such obstacles as the Casavant pipe organ and the chapel's tromp l'oeil angels. There's a jocular, collegiate atmosphere pervading each set, from the dormitories to the after-school hangout. Even the cafeteria looks like a tennis club - intense young actors in whites, chatting interchangeably in English and French, fiddling with Blackberrys and twirling tennis racquets. "The transition was quite natural. It felt like a college, with all the light pouring into the windows," explains Chamberland. "When we got there, the heating and the wiring were okay - thanks to Norman, the janitor of 20 years. We pulled up a 100-foot carpet and found a beautiful maple floor, which was noisy to walk on, but looked great... We built an outdoor tennis court and kept dressing it to look like different courts. The tennis had to look right." Paolo Barzman (Time Is Money), Graeme Lynch (Beverley Hills 90210) and Craig Pryce directed season one, with Valerie Le Gurun as DOP. "At first I was thrown by 15/Love," recalls Barzman. He shot 17 of the show's first-season eps and will direct the bulk of season two. "It's not your typical North American television series for teens. It's much better - darker and edgier, while still fun. It shows both sides of the tennis world. It asks the difficult questions, like why we push these kids so hard, and what role does greed and money play.'" It's "The Breakfast Club at Wimbledon" says Schreyer. The kids come of age in a fishbowl of raw ambition, talent and hormones - bonding over contraband junk food, teen crushes and midnight escapes while vying for fame and endorsement deals. Laurence Leboeuf (Virginie, L'Ombre de l'epervier) stars as the arty anti-jock who is stuck at the academy because her father is the live-in shrink, while Max Walker (P.T. Barnum, The Day After Tomorrow) plays the school's Ferris Bueller, a charismatic rebel who appears uncommitted to tennis. The cast also includes Meaghan Rath, playing a talented ditz, Crew, as a driven femme fatale, and young Sarah-Jeanne Labrosse, a real tennis player, as Sunny, the 12-year-old tennis prodigy who tests everyone's patience with her prima donna antics. Charles Powell and Thierry Ashanti also star. Arnie Gelbart of Galafilm (The Blue Butterfly, Bliss) and YTV are behind the series, along with producers Olivier Bremond and Pascal Breton from Marathon International of France, plus executive producers Jessie Fawcett and Leanna Crouch from Toronto's Telefactory. Funding also came from France 2, the Canadian Television Fund, SODEC, CAVCO, Radio-Canada, the Ontario Media Development Corporation and the Shaw Television Broadcast Fund. YTV holds the English-language rights, while Radio-Canada holds the French-language rights for the dubbed version, called Match! The editing by Arthur Tarnowski is expected to be even more frenetic and energized on season two, and the soundtrack from music supervisor Oliver Sasse will make a bigger impact on the show's tone and style. The story completes the cliffhanger that ended season one, with Leboeuf and Walker's futures at Cascadia held in the balance. Will Leboeuf go to art school? Will Walker become a renegade player on the tennis circuit without backing from Cascadia? The show's newer characters, played by Crew and Madden, continue to find their feet at Cascadia, while little Sunny continues her rampage as the reigning diva. Unexpected new alliances form and dissolve off court and behind the bleachers.